Are starting a model railroad using On30, O gauge, or larger trains. Sometime after we started the BIG Christmas Trains™ buyer's guides, we realized that lots of readers who started out running big trains for Christmas were finding other reasons to leave their trains "set up." We also realized that there were few resource for people who got into the hobby this way. 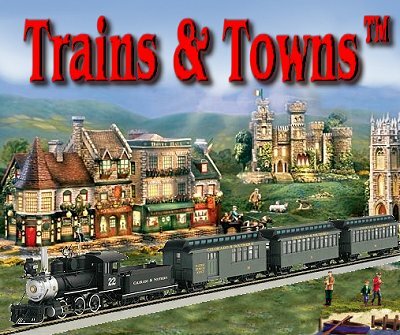 So we've started BIG Indoor Trains™ web site and the Trains-N-Towns™ newsletter to help folks who suddenly find themselves running and liking O scale and larger trains. We hope you find this newsletter helpful, and if you don't, let us know what you'd like to see - that's how we learn and grow. If you're not actually subscribed to the Trains-N-Towns™ newsletter and you want to be, please join our Trains-N-Towns Mailing List It's completely free. If you would like to subscribe to our free newsletter for garden railroaders, please join the Family Garden Trains Mailing List. By the way, you can subscribe to either, both, or neither, and we will just be glad to be of service, no matter what you decide. Fine Print: If you are receiving our e-mail updates and you no longer wish to subscribe, please e-mail me with a "Please Unsubscribe" message (worded any way you wish), and we will graciously remove you from our list. When you contact us, please feel free to ask any questions. We'll get back to you as soon as possible. For the sake of our readers, we also add questions that seem important to our "Letters to the Editor" pages. You may find some interesting and helpful reading there. To read more, or to look at recommended BIG train products, please select an index page below. Note: Big Indoor Trains™, Big Train Store™ Family Garden Trains™, Big Christmas Trains™, and Garden Train Store™ are trademarks of Breakthrough Communications™ (www.btcomm.com). All information, data, text, and illustrations on this web site are Copyright (c) 1999, 2000, 2001, 2002, 2003, 2004, 2005, 2006, 2007 by Paul D. Race. Reuse or republication without prior written permission is specifically forbidden.